If you’re reading this, I assume you survived the three-day weekend in one piece. So welcome back, and lets get started. A column by Steve Scauzillo in the San Gabriel Valley Tribune correctly notes that roads aren’t just for cars, and that pedestrians are paying too high a price just to cross the street. And he describes the dangers of speeding traffic, and having to wave his arms to alert drivers who speed through intersections or aren’t paying attention. But instead of urging drivers to slow down, or reminding them of the dangers their vehicles pose to others, he offers four suggestions to improve safety — three of which are aimed at people on foot. 1. Put down the cell phone when crossing a street. 2. It goes without saying that drivers should never be looking at or talking into a cellphone (except with the aid of a hands-free device). 3. Pedestrians should stop jaywalking. 4. Be alert in crosswalks — they are not impenetrable. Like bicyclists, pedestrians have to look out for their own safety, because too many drivers aren’t looking out for either of us. But the problems on our streets aren’t caused by careless pedestrians. Or bike riders. They’re caused by a driving public that has forgotten that they’re operating big, dangerous machines that can kill in a moment of carelessness. Burbank’s H&S Bicycles is offering a free bike worth up to $1000 for anyone who can help find the burglar who has robbed the store three times this year. 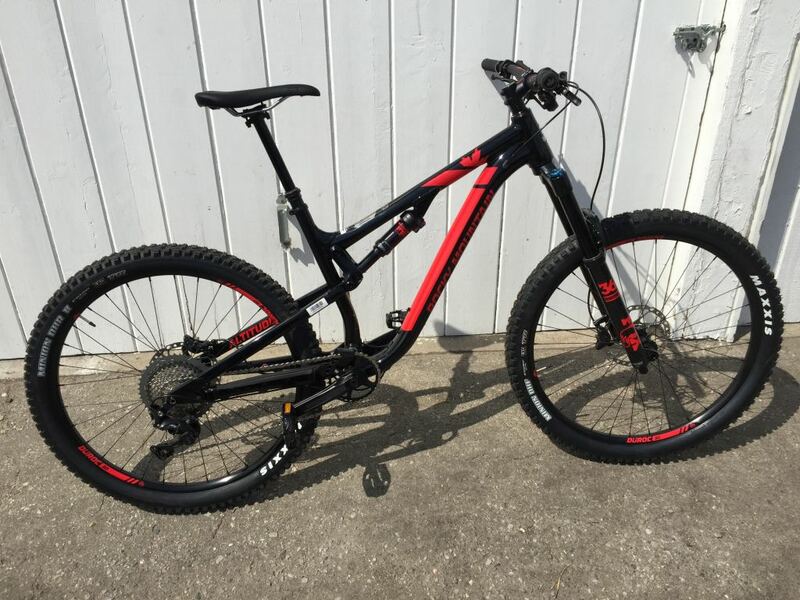 The latest theft involved the 2018 Rocky Mountain Altitude A50 Large seen below. My apologies to whoever sent this to me; I’m afraid I lost track of it over the weekend. But thank you anyway. Speaking of careless drivers, a Jimmy Johns bike delivery rider was hit by a distracted Miami cop while he was riding in a crosswalk. And he was the one who went to jail. The rider was so angry when he was struck by the woman driver as she spoke on her handheld cellphone that he failed to notice it was an unmarked police vehicle. And threw his bike against the car, causing $500 damage. He was arrested for criminal mischief and ticketed for failing to yield. Even though it was at least the third time the same officer had been seen using her phone behind the wheel. Irish UFC fighter Connor McGregor is one of us, riding his bike to train for his recent bout with Floyd Mayweather. Then again, so is the Philadelphia bike cop with the Nazi tattoo. Thanks to Megan Lynch for the heads-up. Thirty-year old Canadian cyclist Michael Woods is turning heads in the Vuelta in just his second Grand Tour, starting today’s stage in eighth place. Meanwhile, Russian cyclist Ilnur Zakarin has slowly worked himself up to a podium position. Cycling Pub offers a wrap-up of the second week of the Vuelta. Caught on video: Once again, a race vehicle has knocked down a cyclist, this time a team car in the Tour of Britain; fortunately, Polish rider Karol Domagalski was not seriously injured. More proof that motorized race vehicles don’t belong in the peloton, whether two-wheeled or four. CNN profiles the great Miguel Indurain, the only cyclist to win the Tour de France in five consecutive years who hasn’t been stripped of his title. Two-time Tour de France winner Alberto Contador calls for a salary cap for pro cycling teams to help keep teams afloat and competitive. A new report says current tests can’t discover the latest generation of hidden motors used for motor doping; naturally, cycling’s governing body begs to differ. Aussie rider Carol Cooke has successfully defended her titles in the road race and time trial at the world Para-Cycling championships; she’s a three-time winner in road cycling, and four-time in the time trial. Former race car driver Alex Zanardi successfully defended his world Para-Cycling time trial championship, and finished half a wheel behind the winner in the road race; he lost his legs in a horrific IndyCar crash in 2001. A 43-year old bike rider was lucky to escape with minor injuries when he was the victim of a drive-by shooting in Rosemead just after midnight Sunday. Santa Monica is installing a state-of-the-art sensor system on some of its buses to detect bicyclists and pedestrians in time to avoid a collision. Metro Bike comes to Venice this Thursday, with 165 bikeshare bikes at 15 docking stations. An Op-Ed in the Orange County Register says the Santa Ana River Trail belongs to the taxpayers, and the homeless camps alongside it have to go. Two hundred San Diego bicyclists rode to honor fallen cyclist Paul Cornish; the 70-year old bike rider, who once set a record for riding from LA to New York, was killed last week by a driver with a suspended license in a stolen car. A 16-year old Hemet pedestrian is in critical condition, and his salmon cycling companion injured, because a driver had a sneezing fit. A Los Banos burglar learns the hard way that if he’s going to carry two loaded guns, a meth pipe, $137 in cash and several coins on the bike he just stole, to put a damn light on it. A Bakersfield writer says the city has wide streets that can accommodate everyone, and needs to build safe infrastructure to improve bikeability and walkability. The San Jose Mercury News takes an ebike trip to Big Sur. Not surprisingly, bicyclists support a new lane reduction project in San Jose. A local paper profiles the policy and planning director for the Marin County Bicycle Coalition, who’s working to make Petaluma more bikeable. City Lab looks at the nationwide trend of using human bollards to create protected bike lanes and call attention to the need to improve safety for bicyclists. Scottish cyclist Mark Beaumont is three-quarters the way around the world as he attempts to circumnavigate the world by bike in just 80 days; he’s currently riding through the US. A Santa Fe truck driver got ten and a half years behind bars for the meth-fueled crash that killed two people when he plowed into a group of five bike riders. A Boulder CO couple has spent the last 14 months driving around the US to ride their bikes all over the country. A San Antonio TX bike non-profit is fighting childhood obesity by allowing children to earn bicycles, requiring 12 hours of work to get the bike they want. The mayor of an Iowa town says building bike trails is good public policy. Minneapolis police remind bike riders that we need to stop for stop signs for our own safety, but get it wrong when a rider takes the lane. I couldn’t care less if you decide to roll a stop when there’s no one else around. But in the name of all that’s holy, observe the damn right-of-way and stop for stop signs if there’s conflicting traffic. Authorities say changing the design of a bike trail on a massive DC area highway widening project could jeopardize the entire thing; bike advocates want the trail moved from next to the highway to the other side of a sound wall, which would violate an agreement with homeowners. Coral Gables FL is planning to use planters and green space to create protected bike lanes. Now that’s a ciclovía. Bolivia banned cars from city streets throughout the entire country for one day, dropping pollution levels up to 70%. Manchester, England police are accused of victim shaming after tweeting that cyclists shouldn’t weave in and out of traffic, after two young women are killed in separate bike crashes that had absolutely nothing to do with that. The Guardian looks at the maker of The Laserlight, which projects an image of a bicycle onto the street 16 feet ahead of your bike. A British sports site offers their ten favorite inspirational quotes about bicycling. An Irish father is riding through all 32 Irish counties in just eight days to raise funds in honor of his 16-year old daughter, who died of a brain tumor. An 18-year old Saudi Arabian woman is using social media to get other young woman riding. Nigerian soldiers ambushed a group of suspected bike-riding Boko Haram terrorists, recovering 18 bicycles, seven swords and a pair of slippers. A Malawi cyclist plans to raise funds to send two needy students to school by riding over six miles uphill while standing up on his bike. A New Zealand coroner blames the death of a woman bicyclist on brakes that were too large for her small hands, recommending that every bike rider should have a properly fitted bicycle. Perth, Australia will invest $129 million to fill in the gaps and dead ends in the city’s network of bike paths. The war on bikes continues, as a road raging Aussie driver intentionally rammed a bike rider; no word on the condition of the victim. When an ebike rider flees the scene after running down an elderly Shanghai woman, it sparks a debate over whether riders of electric bikes should carry liability insurance. No, seriously. If you ride your girlfriend’s bike to break into an office, try not to steal any cremated remains. If you’re going to steal a $2,000 bicycle from an unlocked garage, leave your $100 beater bike in its place. And proof that you can ride a bike in a skirt. Even if you’re a man. My condolences to the family and friends of Paul Cornish.